Home > Bedding > Bedding By Fabric > Satin Sheets > Adjustable Bed Size Satin Sheet Set Eastern King Split 76 in. x 80 in. 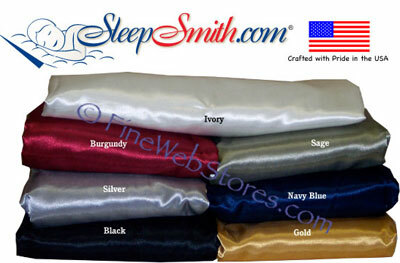 Our satin sheet sets come with a top sheet, 2 fitted bottom sheets and two pillowcases. They are generously cut to fit a mattress as thick as 16 inches. They are generously cut to fit a mattress as thick as 16 inches. This split bed sheet set gives you the option of including one solid sheet measuring 76 in. x 80 in., or two separate sheets measuring 38 in. x 80 in. If you choose to add a matching comforter you will have the option to get a solid matching comforter or two separate matching comforters each measuring 38 in. x 80 in. depending on which will work best for you.